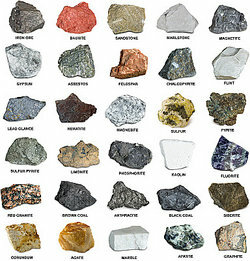 The three basic types of rocks are igneous, metamorphic and sedimentary. Sedimentary rocks make up most of the rocks on the earth and are formed when bits of rock, soil or organic matter settles and accumulates. Plant and animal fossils can be found in sedimentary rock. When there is an abundance of plants and animals, fossil fuels develop, like oil, natural gas and coal. Types of sedimentary rocks include carbonate rocks, chemically precipitated rocks, clastic rocks and coal. Carbonate rocks are made mostly of carbonate minerals, coming from of bioclasts created by calcareous organisms, such as corals or mollusks. Limestone and dolostone make up the majority of carbonate rocks. Foreland basin - Foreland basins are formed when continents collide and a shallow basin forms. Back-arc basin - These submarine basins are formed when the edge of a continent collapses or when an oceanic trench moves. An example is the Sea of Japan. Different sedimentary rock examples can be found worldwide; but, the basic process that constructs the rocks remains the same. "Sedimentary Rock Examples." YourDictionary, n.d. Web. 19 April 2019. <https://examples.yourdictionary.com/sedimentary-rock-examples.html>.